I have listed a new property at 301 1088 QUEBEC ST in Vancouver. This is a large, bright, renovated, two bedroom and two bath condo with lovely outlooks to False Creek, Science world and the trees of the courtyard. Updated kitchen with new cabinets, granite countertops and all stainless steel appliances.Updated powder room, maple hardwood floors, and open floor plan. Big rooms, corner gas fireplace and Southwest exposure make for comfortable and easy living. Great facilities in the building include a swimming pool, hot tub, sauna and gym. It's an easy walk to the seawall and around the corner to the Olympic village, Downtown, The Skytrain, Roger's Arena, BC Place, shopping and all that Vancouver has to offer . Unbeatable value for this size and location. YOU'LL LOVE IT! I have listed a new property at 3293 18TH AVE E in Vancouver. NO HST! This is a one of a kind custom home. There is lots of space for your family with four bedrooms and three bathrooms upstairs. The master bedroom has a balcony with views of downtown and a large luxurious ensuite bath.There is a large, open plan main floor. The kitchen is top quality with quartz countertops, tile backsplash, a big island, BOSCH appliances and a Thermador cooktop in the wok kitchen. A big dining room and formal living room make this house perfect for entertaining. Beautifully finished with crown moldings, a tumbled marble surround and a two piece powder room. Downstairs there are two suites and a laundry room. Air conditioning, radiant heat and conveniently located. YOU'LL LOVE IT! Please visit our Open House at 3293 18TH AVE E in Vancouver. I have sold a property at 404 2515 ONTARIO ST in Vancouver. TOP FLOOR true 1 bedroom + flex/den in ELEMENTS in quiet sunny side of bldg. Gorgeous sun-drenched NY loft style suite in rock solid CONCRETE building still under warranty. Heritage reclaimed bricks, fir plank floors, super-high ceilings, energy efficient floor to ceilings windows, balcony. Skylights, gas stove and fireplace, gourmet kitchen with granite and shaker wood cabinets, walk-in closet w/ laundry are just some of the features. 1 UG parking w/hangers for 2 bikes plus extra large storage locker. Building features gym, library, garden, PET friendly. In hot MOUNT PLEASANT neighborhood near Main, Cambie, Olympic Village, Canada Line - you can walk or bike to everything! VANCOUVER, B.C. 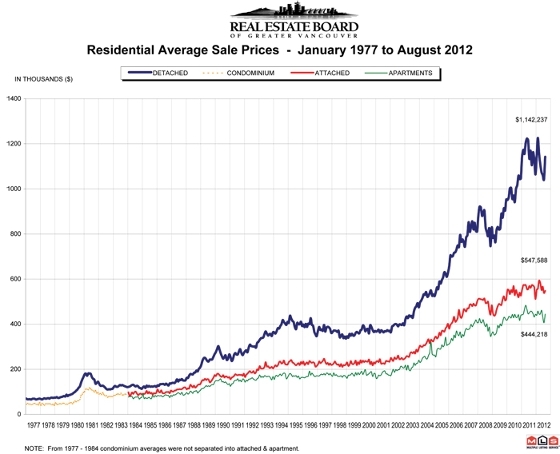 – September 5, 2012 – Home sale activity remained below long-term averages in the Greater Vancouver housing market in August. Please visit our Open House at 669 31ST AVE E in Vancouver.